Much as many of us enjoy winter in Minnesota, the especially cold and snowy day make us long for warmer weather. When people starting thinking of summer they often think of wanting to be outside to enjoy what can often be very hot days. They are also thinking about how to make a space inviting and comfortable. What makes an outdoor space inviting? What draws you into a space? What draws guests to one area and not another? When people congregate in a garden they are often gravitate to the open areas. A common theme is to have two weathered, comfortable Adirondack chairs – complete with with foot rests – tucked up against some gently rustling plants or shrubs. 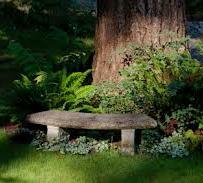 For others, a stone bench set among foliage in a cool and shady corner of your yard is the perfect relaxing spot. When creating a land- scape layout, a designer plans for outdoor seating areas based on the functions the homeowner wants, and then the designer will suggest garden furniture, hardscapes such as paths and patios, and garden elements to add to complement those areas. Separate areas of your yard can comfortably direct traffic flow. 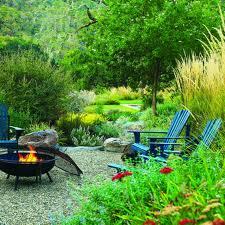 The seating areas are the road map that shows how to travel the landscape and garden space. Guests instinctively are directed to relax, to go this or that direction, and where else to go. Creating outdoor living and seating areas extends a house’s footprint and adds to the entertaining areas. Start by defining physical space boundaries to create your seating areas. The definition of space and the size will dictate how the space is ultimately used. Large open spaces invite larger groups of people, while smaller spaces will attract fewer people and make it into a more intimate space. Combining large outdoor spaces with smaller intimate areas within them helps accommodate any size of gathering, whether it the group is large or small. The rule of thumb is to have both large and small seating areas as different social needs will require the different spaces and chances are they will both be used. Boundaries can be used to create outdoor living rooms by using elements such as your house, garage, fences, arbors, trellis and screens. Outdoor seating areas are just one element of a workable and attractive landscape design plan. If you’ve got a vision for traffic flow and providing comfortable resting and gathering spots in your yard but aren’t sure where to start, give our creative and helpful designers a call.